Primarily an eastern North American wood species, black walnut is one of the more unique woods available to furniture makers. Its rich, deep brown heartwood places this premium domestic hardwood on the expensive side when compared to other North American species. Our selection of walnut laminate lecterns embodies this dark brown color with plastic laminate application. In addition to furnishings, woodworkers have been known to use black walnut for interior paneling, flooring, gunstocks, and smaller turned objects such as bowls and vases. 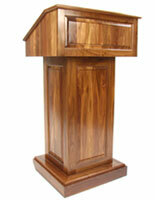 Available for sale are indoor and outdoor-rated walnut laminate lecterns. The indoor models feature plastic laminate applied to a rigid substrate. 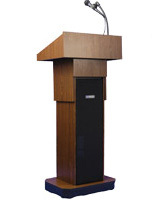 The podiums are height adjustable, making them good choices for school auditoriums, trade shows, and churches which typically feature many different speakers. Some models offer amplified sound systems with either wired or wireless mic options. The amplification is powered with 50 watts; plenty of juice to fill a room with sound. 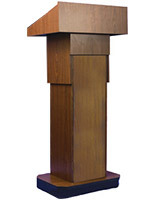 The exterior-rated podiums are manufactured from molded polyethylene in a one-piece construction. Eminently waterproof, these lecterns are extremely tough and have been subjected to rugged product testing in order to prove it. Each model features a walnut laminate insert that gives the plastic lectern its character. We sell these insert panels separately as well, so if you desire to switch the type of wood grain and color, it's an easy task.